Mu Xiaohu (aka. Su Jiannan) is a Beijing-based producer releasing electronic music and DJ sets as Mu Xiaohu and Su. Su focuses more on experimenting with a broad variety of musical elements, whilst Mu Xiaohu emphasis on electronic dance music. 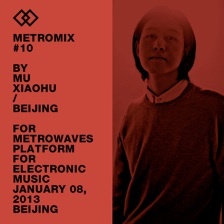 This is Mu Xiaohu’s second mix for Metrowaves.